John 6:35: Jesus declared, "I am the bread of life. 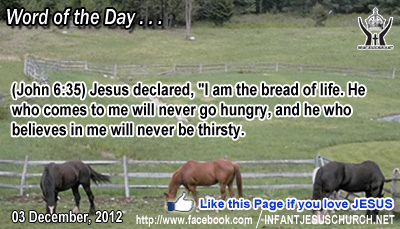 He who comes to me will never go hungry, and he who believes in me will never be thirsty. Holy and Righteous Father, fill me with Jesus. Give us today, my Daily Bread, that we may find life in all its fullness. Precious Lord, fill us and touch us with your presence so that we can serve you by blessing those around us with your grace. In the name of Infant Jesus, we pray. Amen. 5As he entered Caper'na-um, a centurion came forward to him, beseeching him 6and saying, "Lord, my servant is lying paralyzed at home, in terrible distress." 7And he said to him, "I will come and heal him." 8But the centurion answered him, "Lord, I am not worthy to have you come under my roof; but only say the word, and my servant will be healed. 9For I am a man under authority, with soldiers under me; and I say to one, `Go,' and he goes, and to another, `Come,' and he comes, and to my slave, `Do this,' and he does it." 10When Jesus heard him, he marveled, and said to those who followed him, "Truly, I say to you, not even in Israel have I found such faith. 11I tell you, many will come from east and west and sit at table with Abraham, Isaac, and Jacob in the kingdom of heaven. The centurion was an officer in charge of a hundred soldiers. In certain logic, he was the backbone of the Roman army, the strength which held the army together. An ancient writer, describes what a centurion should be: "They must not be so much daring seekers after danger as men who can command, steady in action, and reliable; they ought not to be over-anxious to rush into the fight, but when hard pressed, they must be prepared to hold their ground, and die at their posts. "The centurion who approached Jesus was not only courageous, but faith-filled as well. He risked the derision of his cronies as well as mockery from the Jews by seeking help from an traveling preacher from Galilee. Nonetheless, the centurion approached Jesus with great self-confidence and humility. He was an unusual man because he loved his slave. In the Roman world slaves were treated like animals – something to be used for work and enjoyment and for bartering and trade. This centurion was a man of great compassion and surprising faith. He wanted Jesus to heal his beloved slave. Jesus commends him for his faith and instantaneously grants him his request. Are we willing to suffer ridicule in the practice of our faith? And when we need help, do we approach the Jesus with expectant faith? Loving Infant Jesus, you feed us daily with your life-giving word and you maintain us on our journey to our true homeland with you and the Father in heaven. May we never lose hope in your promises nor delay in zeal for your kingdom of virtue and peace.